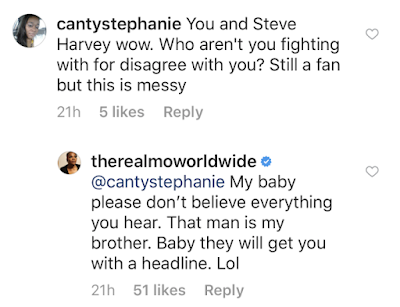 Did Mo'Nique Threaten To Slap Steve Harvey On His Show? During a recent taping of the Steve Harvey talk show things got a little heated when Mo'Nique threatened to put her hands on him. According to TheJasmineBrand.com, Mo’Nique was recently a guest on the “Steve” show to promote her upcoming residency in Las Vegas, but it all went left when Steve told Mo'Nique that she needed to apologize to Whoopi for comments she made in an interview with Vulture, a source said.The pair were reportedly discussing Mo’Nique‘s recent controversial comments about Whoopi Goldberg when things took a turn. “Steve said she needs to apologize,” a source explained, referring to Mo’Nique calling Whoopi “the help” in a recent interview. “She threatened to hit Steve in the face. He told her if she hit him, her husband would have to come out and square off,” the same source added. 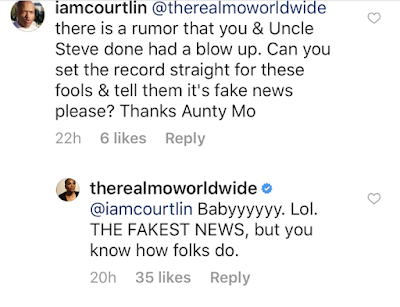 Mo'Nique set the record straight on Instagram! Receipts below!